The Hurliman Scholarship Foundation is a charitable organization established to assist students in Fremont, Custer or Pueblo counties in Colorado. 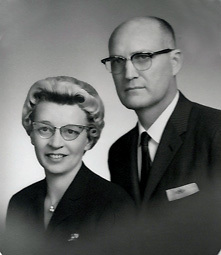 Both Dr. and Mrs. Hurliman envisioned the formation of an organization that would benefit local high school seniors who planned to continue their education at a college or university. Before her death in 2007, Mrs. Hurliman helped set up the Foundation. The Foundation will award at least two four-year college scholarships and may also award a number of one-year scholarships to outstanding high school seniors. The selected students must demonstrate superior scholastic ability and strength of character. The awards will cover tuition, room and board and book allowance (up to $25,000/year). Students may attend any accredited college or university in the United States and will not be restricted in the fields of study they want to pursue. The four-year scholarships are renewable annually based on adequate progress and performance at the selected colleges or universities. Jack C. Hurliman was born in Missouri in 1911, the fifth of six children of Samuel and Leila Hurliman. Jack graduated from Glenwood High School in Missouri and continued his education at Northeast Missouri State Teachers College and Kirksville College of Osteopathic Medicine. After passing his medical boards, Dr. Hurliman set up practice in Canon City. It was 1937 and, at the time, there were four other doctors in town and the population of Canon City was around 7000. Dr. Hurliman established the Hurliman Clinic in 1941. Over the years, he delivered close to 3000 babies (many of whom were born at home). In 1950, he purchased the Colorado Hospital and directed its operation for more than 15 years. He retired from medicine in 1982. Dr. Hurliman was a life member of both the Colorado Osteopathic Association and the American Osteopathic Association. He was a past city councilman of Canon City and a 25-year member of the planning commission. Dr. Hurliman was a member of the First Christian Church where he served as an Elder for more than 45 years. He was a member of the University Club, Shadow Hills Golf Club, Mt. Moriah Lodge #9, A.F. and A.M., Al Kaly Temple and BPOE Lodge #610. For many years, Dr. Hurliman also owned and operated his family´s farm in Putnam County, Missouri. Dr. Hurliman died on March 8, 1985 at age 73. Edith E. Hurliman was born in Missouri in 1914, the second daughter of Robert and Edna Yowell. Edith graduated from Kirksville High School at age 16 and attended Northeast Missouri State Teachers College for three years. Although she received a certificate to teach, Edith really wanted to be a nurse, so she went to the three-year program at Laughlin School of Nursing to become an RN. In her last year of nurse´s training, she met Jack Hurliman who was an intern at the hospital. They were engaged on Valentine´s Day, 1937 and were married on Thanksgiving Day that same year. After the ceremony, they moved to Canon City and never lived anywhere else. In 1949, the Hurlimans bought their “dream home.” Through several additions and renovations, this is where they spent the remainder of their years. Edith and Jack began traveling extensively in 1967. In 1970, during a 2-month world trip, they met Pope Paul VI at the Vatican in Rome. This was a significant event in their lives. Edith Hurliman enjoyed reading, playing bridge and golf. She was a 70-year member of the First Christian Church. She was also a member of the PEO, chapter FC and Eastern Star. Mrs. Hurliman was 92-years-old when she died on July 7, 2007 at her home in Canon City. Lila L. Anastas is the niece of Jack C. Hurliman. She received a B.S. degree from Syracuse University College of Nursing where she was a member of Phi Kappa Phi and Sigma Theta Tau. She received an M.S. in Gerontology Counseling from California State University, Sacramento. Ms. Anastas holds an active California R.N. license and for three years was an adjunct faculty member in the Gerontology Department at American River College (Sacramento). She is a former board member of California League for Nursing; California Writers Club (Sacramento branch) and SouthWest Writers (Albuquerque, New Mexico). Ms. Anastas has enjoyed a 35-year career as a journalist and freelance writer. She´s the author of four published health books, one of which was a national best seller. For the past nine years, Lila and her husband George have lived in Albuquerque. They are the parents of five children and have twelve grandchildren. Deanne Nocetti is the great niece of Jack C. Hurliman. In 1991, she received a B.A. degree from the University of San Francisco (USF) where she played volleyball for four years. Immediately after graduation, Ms. Nocetti was appointed as Membership Director at USF’s Koret Health and Recreation Center which served a community of over 3,000 members. She was selected as volleyball coach at San Francisco State University, University of San Francisco and Sacred Heart Cathedral Preparatory. In 1995, Ms. Nocetti was hired as office manager and sales assistant for Newsweek magazine’s San Francisco Bureau. After several years at Newsweek, Ms. Nocetti and her family moved from the San Francisco area to the Sacramento area. She and her husband Ron are parents of four children. Ms. Nocetti currently works part-time for an Accident Reconstruction company in Carmichael. Niki A. Calastas is the great niece of Jack C. Hurliman. She received her undergraduate degree from the University of California at Irvine and her M.A. degree from the University of Melbourne, Australia, where she is an inaugural member of the Alumni Council. Ms. Calastas is the Manager for the Economics Department at Monash University, overseeing faculty, staff, degree and course offerings for the University’s 7 International campuses. Prior to this role, Ms. Calastas served for eight years as the Administrative Director for the Public Policy Program at Stanford University. Niki and her family live outside of Melbourne, Australia. Keira Nocetti graduated from the University of San Diego with a B.A. degree in Sociology. During her time at USD she was a four year DI rower and founded the Zeta Rho chapter of Kappa Delta on campus. After graduation Keira went to work as a Management Trainee at the San Diego Cintas plant. Today she continues at Cintas as a supervisor and part time yoga instructor. Granville L. Larimore is the nephew of Jack C. Hurliman. He received his B.S. and M.S. degrees from Florida State University and worked for the Environmental Protection Agency for thirty years. He lives in Atlanta, Georgia. Ronald W. Nocetti received his B.S., M.S. and doctorate degrees from the University of San Francisco. He has worked in the fields of education and sports management for 26 years. Dr. Nocetti is currently the Associate Executive Director of the California Interscholastic Federation. If you have additional questions about the Hurliman Foundation Scholarship, please contact us with any of your concerns. Check out our calendar for important dates. Find out the requirements to apply.